Netwave NW-6000 VDR - Mackay Communications, Inc. 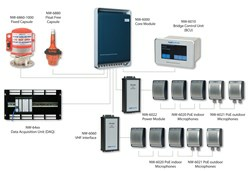 The Netwave NW-6000 VDR (Voyage Data Recorder) Series is indicative of Netwave Systems’ commitment to manufacturing highly advanced new generation Voyage Data Recorders. Its flexible design is easily adaptive to new build installations as part of IBS, or in retrofit applications, offering enhanced features. The unique system architecture of Netwave’s VDR Systems, interconnect numerous ship components by a single Ethernet cable that also provides power and data, thus eliminating extensive and costly cabling requirements. This attribute typically reduces cabling costs by 50%! The NW-6000 VDR System provides the smallest footprint, the most economical installation costs, unrivaled operational value due to added functionality, and is compliant with MSC 333(90). The system’s management tools and data features improve transparency in operational performance. Join the 5500+ vessels that currently rely on Netwave VDR’s.